The 1971 uprising of inmates at Attica State Prison turned violent but brought attention to the treatment of prisoners. We talk with an historian about the legacy of Attica. "We are not beasts." That was the refrain of inmates at one of America's most notorious prisons during what would be the deadliest prison riot in the country's history. On September 9, 1971, nearly 1,300 prisoners took over Attica State Correctional Facility in upstate New York to protest for more humane living conditions in the overcrowded penitentiary. Rioters took hostages and demanded negotiations with the state. After days of negotiations, state police moved in to retake the prison by force at the order of the Governor. Scores were killed or wounded - inmates, corrections officers and civilian employees. What followed after the deadly uprising were allegations of a cover-up. The incident was significant in the movement for prisoners' rights. This year marks the 45th Anniversary of the deadly uprising. Historian Dr. Heather Ann Thompson has documented the story in her new book Blood in the Water, which was a finalist for the National Book Award. We talk with her about the legacy of Attica, the prisoners' rights movement and the consequences of mass incarceration. Events: Heather Ann Thompson will be in Charlotte this Wednesday (Nov. 30th). She's signing books at the Harvey B. Gantt Center 10:30-11:30am and giving a talk at UNC Charlotte Center City at 6:30pm (Registration here). "To Ms. Thompson, a historian at the University of Michigan, the revolt was both an important civil rights struggle by some of America’s most marginalized people and a crucial part of the origin story of today’s battles over mass incarceration, police violence and the Black Lives Matter movement." 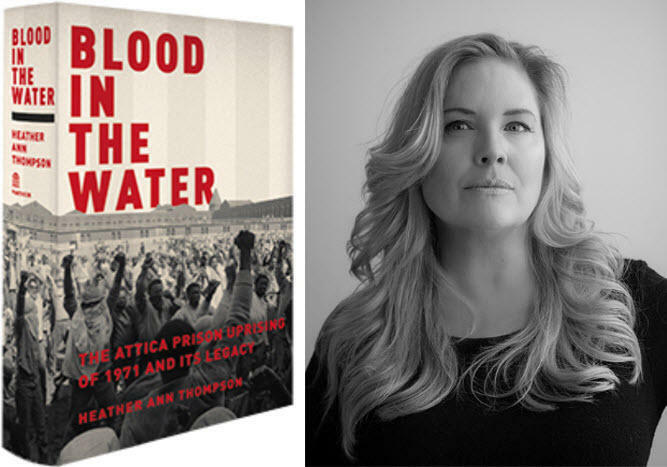 "Not all works of history have something to say so directly to the present, but Heather Ann Thompson’s “Blood in the Water: The Attica Prison Uprising of 1971 and Its Legacy,” which deals with racial conflict, mass incarceration, police brutality and dissembling politicians, reads like it was special-ordered for the sweltering summer of 2016."